Continental Refrigerator 1RE-SS 28 1/2" Solid Door Extra-Wide Reach-In Refrigerator - 21 cu. ft.
With 21 cu. 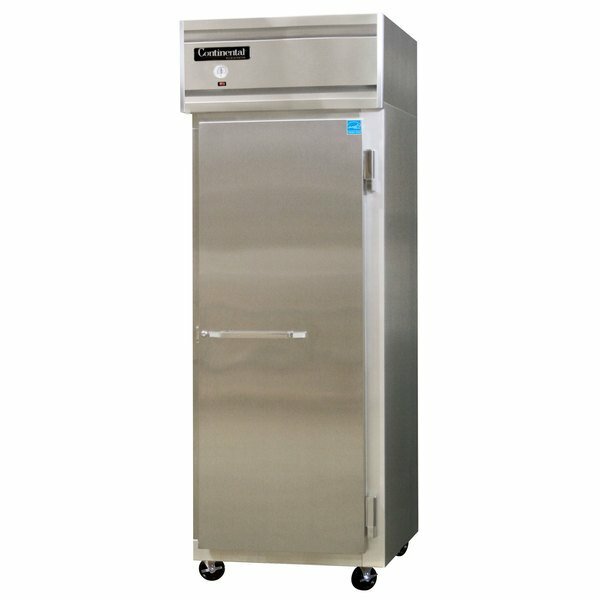 ft. of internal storage space and an array of innovative features, this Continental Refrigerator 1RE-SS 28 1/2' solid door extra-wide reach-in refrigerator provides exceptional and reliable performance for your foodservice operation. 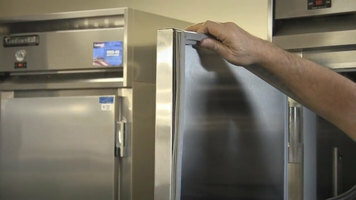 Modern, state-of-the-art styling and chrome-plated flow line handles make this unit one that's both professional in appearance and practical in use for all your cold storage needs. A stainless steel exterior and interior keep the unit easy to clean, which serves to increase sanitation throughout the kitchen. That spacious interior boasts 3' non-CFC polyurethane foam insulation, in addition to environmentally-safe R-134a refrigerant and three heavy-duty, epoxy-coated shelves. For added convenience, self-closing doors with cam-action lift-off hinges help maintain a cold internal temperature while maximizing workplace efficiency for your staff. Monitor the refrigerator's temperature with the external dial thermometer, and worry less about those food items which require longer holding times thanks to an integrated automatic electric condensate evaporator. A total of four 5' casters make moving the unit easy, both when attempting to relocate to another destination or to simply clean behind it. Other features include a magnetic snap-in door gasket, automatic interior lighting, energy-saving switch for door heater, and an external dial thermometer. This unit includes an electronic controller with digital display and hi-low alarm. Continental Refrigerator 1RE 29" One Section Extra Wide Reach-In Refrigerator - 21 Cu. Ft.
Continental Refrigerator 1RE-SA 29" Solid Door Extra Wide Reach-In Refrigerator - 21 Cu. Ft.